A high level ground helmet from STEIN Certified to EN397. Featuring a traditional 6-point polyethylene harness with three levels of height adjustment for added comfort and the OneTouch slip ratchet adjustment system. This adjustment system allows for the helmet to be adjusted whilst fitted. Supplied with HELLBERG SAFE 2 (30snr) Ear Defenders and Metal Mesh Face Visor as standard. Also supplied with the helmet is a self-application reflective Sticker Kit which conforms to Class R2 EN12899-1. In tests, this helmet proved far tougher than the EN397 standard required and far tougher than any of its competitors. Traditional 6-point polyethylene harness with three levels of adjustment. 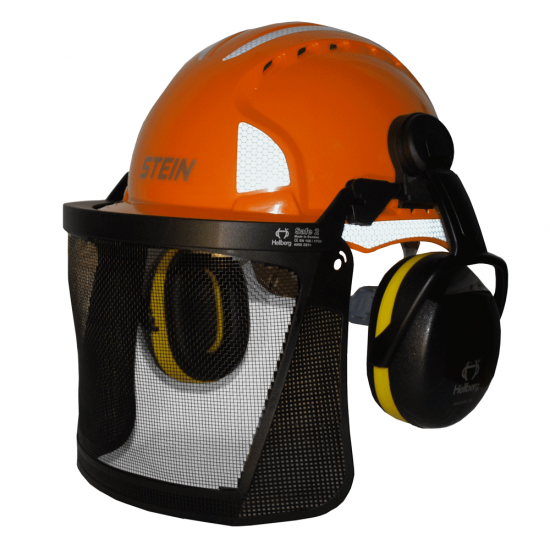 Enables firm fitting of a range of safety visors and ear defenders.